Last August, Asad Hussein boarded the back of a truck in Dadaab, Kenya, sitting with other passengers among sacks of beans being transported to Somalia’s capital. The truck headed east across the desert over the Somali border and deep into territory controlled by al-Shabab, the violent extremist group, on its way to Mogadishu. The 700-kilometer trip, which Hussein wrote about in The New York Times, represented a chance for him to see where his father grew up. Now, he’s preparing for a new journey after being accepted by one of the world’s most prestigious universities. The 22-year-old refugee plans to join the class of 2022 at Princeton University, in the eastern U.S. state of New Jersey. Hussein was born in Dadaab, one of the world’s largest refugee camps, in 1996. His parents and older sister had fled the war in Somalia five years earlier in search of a new life. 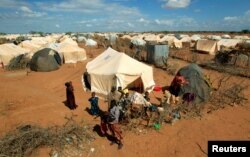 Dadaab was meant to be temporary, but it became home. Hussein’s sister, Maryan, immigrated to the United States in 2005 with her husband and son. Only 11 years later did the siblings reunite, when Maryan returned to Dadaab on a visit that Hussein also wrote about in The Times. Despite those limitations, Hussein said, people were determined to make lives for themselves. They had escaped war, and they were bound to keep fighting. The key, people told Hussein, was education. Meanwhile, Princeton – which admitted just 5.5 percent of all applicants for the class of 2022 – has been among some U.S. colleges and universities trying to diversify their student bodies. That includes welcoming academic high achievers who, like Hussein, may not have the financial means independently. Hussein said he’s been offered a full scholarship to Princeton, which estimates that tuition, room, board and fees will total $70,010 for the next academic year. In the university’s 2021 graduating class, 13 percent are international students – with representation from 11 African nations. Founded in 1746, “Princeton has depended since its inception, and depends today, on the talent and contributions of newcomers to this country,” its president, Christopher L. Eisgruber, wrote last month in an annual letter to the campus community. Last week, Princeton joined 30 other colleges and universities in challenging the Trump administration’s proclamation to restrict immigration from several Muslim-majority countries. The university filed a brief with the U.S. Supreme Court to support the state of Hawaii’s challenge, it said in a news release. Ty McCormick, the former Africa editor at Foreign Policy, invited Hussein to write about President Donald Trump’s travel ban after reading his work in The Times. “He’s an extraordinary young man: brilliant, focused, and driven to better himself and those around him,” McCormick told VOA. “Although I have become a mentor of sorts, I think it’s fair to say I’ve learned more from him than he has from me. All of the credit for this incredible achievement belongs to him. He overcame tremendous obstacles to get where he is – obstacles most of us can’t fully comprehend. My hat is off to him,” McCormick said in a written response. Hussein hopes his achievement will change people’s minds about what refugees can accomplish. Now, Hussein’s journey will take him to the same campus that produced theoretical physicist Richard Feynman, former President Woodrow Wilson and first lady Michelle Obama. Hussein, an avid fiction reader, said he wants to study English and history. And, for the first time since he was 9, he will live in the same country as his parents and sister.